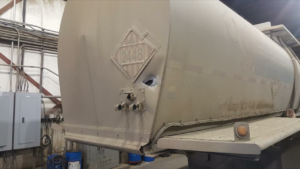 Grande Prairie, Alberta – Grande Prairie RCMP are actively investigating and seeking the public’s assistance after a report of a firearm being discharged at a moving tanker truck on Highway 40. October 18, 2017 at approximately 4:00 pm, the tanker truck was travelling southbound on Hwy 40, about 45 km south of Grande Prairie, when an unknown northbound pickup truck discharged a firearm at the tanker truck. The tanker truck sustained damage to the driver side door. The driver was not injured and the tanker was not hauling any flammable product. Grande Prairie, Alberta – Grande Prairie RCMP General Investigation Section/Drug Unit arrest two individuals which resulted in the seizure of illicit drugs, money and the recovery of a stolen loaded firearm. On July 13, 2017, Police were conducting an investigation which led them to the parking lot of local pharmacy where a male and female were arrested from a motor vehicle without any incident. Following their investigation, police seized 35 grams of cocaine; 13 grams of methamphetamine; $ 2400.00 in cash and recovered a loaded firearm taken in a break and enter of an unrelated investigation. 34-year-old Jeante MADDOX has been charged with three (3) offences under the Controlled Drugs and Substances Act and twelve (12) offences under the Criminal Code of Canada. A female has also been charged in this matter. Her name will not be released at this time since an Information has not yet been sworn. MADDOX is scheduled to appear in Grande Prairie Provincial Court July 31, 2017. The Grande Prairie GIS Drug Unit continues to investigate street level trafficking, as well as their suppliers. Grande Prairie, Alberta – On June 29, 2017 at approximately 9:35 PM, Grande Prairie RCMP General Investigation Section/Drug Unit executed a search warrant at a residence in Grande Prairie. Once in the residence, police recovered stolen property, such as bicycles, Identification cards and credit cards. Police also seized four firearms, three of which were loaded, some ammunition and a variety of illegal drugs. Police arrested and charged 5 individuals as a result of the investigation. Bradley FORSETH (27), Austin BATES (22), Debbie JONES (30), Jarret BEAULIEU (26) and a female youth (16), all from Grande Prairie, have been charges with several Criminal Code offences including possession of a loaded prohibited weapon; unauthorized possession of a firearm and possession of a controlled substance. A total of 95 charges have been laid as a result of the search warrant. FORSETH, BATES, JONES and BEAULIEU are to appear in Grande Prairie Provincial Court on July 24, 2017. The female youth who cannot be named under the provisions of the Youth Criminal Justice Act is to appear in Grande Prairie Provincial Court on July 17, 2017. Grande Prairie, Alberta – On July 6, 2017 at approximately 1:45 AM, Grande Prairie RCMP Crime Reduction Unit (CRU) conducted a traffic stop which resulted in the arrest of a female for possession of stolen property. While on patrol, police noticed a vehicle without it’s lights on. They continued to follow the vehicle from a distance and determined the vehicle to be stolen. The police safely stopped the vehicle in the area of 94 Avenue where the lone female driver of the vehicle was arrested without incident. Upon searching the vehicle police recovered stolen property stemming from previous occurrences and a weapon in arms reach of the driver. The RCMP is currently working on returning the property back to their rightful owners. FEHR has also been charged with operating a motor vehicle without holding a subsisting operator’s licence under the Traffic Safety Act. She is to appear in Grande Prairie Provincial Court today July 12, 2017. County of Grande Prairie, Alberta: The search still continues for a man after the Grande Prairie RCMP were notified on Saturday June 10, 2017 at approximately 7 P.M. that a boater was missing on the Smoky River near Riverstone Golf course. RCMP has conducted several searches in the area with the assistance of Air Services and local Technical Search and Rescue Teams. Due to unstable terrain in the area and high water levels, search efforts were resumed today by air and boat. RCMP Grande Prairie are requesting the public to stay away from the area as the search continues, and to report any information pertaining to this investigation that would assist in our efforts to locate this individual. Grande Prairie, AB : On May 19th, 2017 the Grande Prairie Municipal Traffic unit conducted pedestrian and crosswalk enforcement. As a result, several motorists were charged with failing to yield to a pedestrian in a marked crosswalk. Stay alert and slow down on residential streets and through school and playground zones. Always use crosswalks and pedestrian-activated signals when they are available and cross only at intersections if they are not. Never jaywalk. Drivers are not anticipating pedestrians crossing in the middle of the street so they may not have enough time to avoid hitting you. Be seen! Wear bright colored or reflective clothing especially when walking in low light or poor weather conditions. If you are impaired, seek assistance and alternative transportation. Alcohol is often a factor in serious pedestrian collisions. On average over one-third of pedestrians in fatal crashes and 15 per cent in injury crashes had consumed alcohol prior to the collision. Abide by traffic signs and signals. The penalty for failing to yield to a pedestrian carries a $776.00 fine and 4 demerit points. The driver of the vehicle, 41 year old Matthew CLARKE from Grande Prairie, was arrested and charged with the following Criminal Code Offences: Possession for the Purpose of Trafficking x 2, Proceeds of Crime and Possession of a Controlled Substance. Police are continuing their investigation and are requesting anyone with information regarding this matter to contact Grande Prairie RCMP Detachment at 780-830-5700 or should you wish to remain anonymous, you can contact Crime Stoppers by phone at 1.800.222.8477 (TIPS) or by Internet at www.tipsubmit.com. Grande Prairie, Alberta: RCMP are investigating a break and enter and theft of several handguns from a business located on the West side of Grande Prairie. 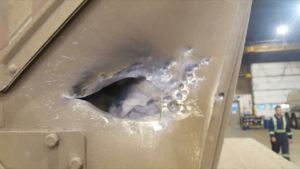 At 5:15 am on April 26 police were called to an alarm at a local business. Unknown person(s) damaged the front door and gained entry to the business where they stole several handguns. Grande Prairie Forensic Identification Section is assisting with the investigation. If you have information which you believe may assist police in their investigation, please call the Grande Prairie RCMP at (780) 830-5700. Should you wish to remain anonymous, you can contact Crime Stoppers by phone at 1.800.222.8477 (TIPS), by Internet at www.tipsubmit.com, or by SMS (check your local Crime Stoppers [www.crimestoppers.ab.ca] for instructions on how to do). You do not have to reveal your identity to Crime Stoppers, and if you provide information to Crime Stoppers that leads to an arrest(s), the recovery of stolen property, and/or a seizure of illicit drugs, you may be eligible for a cash reward. Grande Prairie, Alberta: In the early morning of April 2, 2017, Grande Prairie RCMP were dispatched to assist EMS at a residence on the east side of the city. Ronald Ernest GAUTHIER, 38, of Leduc County, Alberta has been charged with Attempted Murder Section 268(2) C.C. He will appear in Grande Prairie Provincial Court today. If you have information about this investigation or any other investigation, please call the Grande Prairie RCMP at 780-380-5701, or call your local police detachment. If you want to remain anonymous, you can contact Crime Stoppers by phone at 1-800-222-8477 (TIPS), by internet at www.tipsubmit.com, or by SMS.